What became of the Loop restaurant where Mayor Richard J. Daley had his power breakfasts? Geoffrey Baer has the details on that story, and revisits an explosive chapter in a North Side manufacturer’s history. Do you have any more information, collection of stories, photographs of, the Henrici’s Restaurant (near O’Hare) from the 1940s and beyond? My father as a teen worked at that location during the years of 1946-7. Henrici’s was indisputably a Chicago institution that billed itself as “Chicago’s Most Famous Restaurant” and for a time, it might well have been. It was started as a small coffee and pastry shop in 1868 near Madison and Wells by Austrian immigrant Philip Henrici who came from a noted Vienna family of restaurateurs. That shop burned down in the Great Fire, but he rebuilt in a few different places before settling in the heart of Chicago’s theater district on Randolph Street between Dearborn and Clark streets. The restaurant became a favorite of touring performers like Al Jolson, Henny Youngman and Danny Thomas, and local politicians, including Mayor Richard J. Daley, who had power breakfasts there almost every morning. It was torn down to build the Civic Center later named for Daley. Henrici’s was a white-tablecloth establishment serving mid-priced American fare like prime rib and lobster and freshly baked pastries for dessert, including the coffee cake in the recipe below. One of their signatures was coffee served with a pitcher of whipped cream on the side. 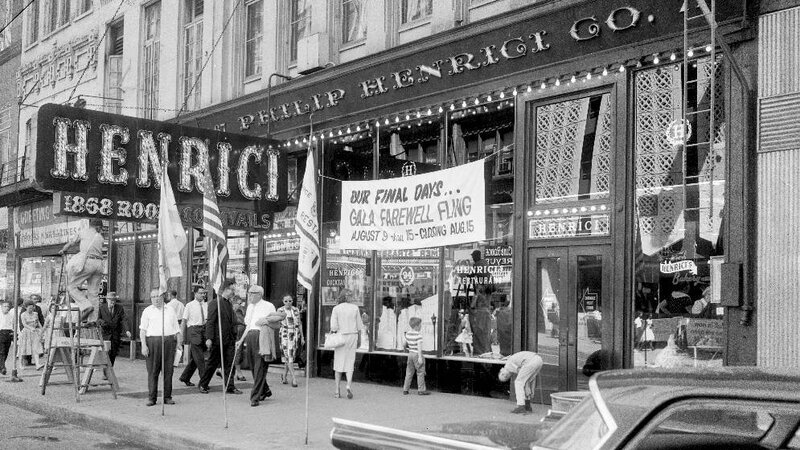 They also advertised Henrici’s as having “no orchestral din,” meaning no live music. Henrici’s eventually expanded to 20 locations in the Midwest. The location near O’Hare Airport was at the O’Hare Inn motel at Mannheim and Higgins and known as Henrici’s Golden Barrel. It opened the same year the Kennedy Expressway was extended to O’Hare. Unlike Henrici’s on Randolph with its “no orchestral din,” the Golden Barrel featured dancing girls and live bands. After Henrici’s on Randolph was torn down in 1962, some original relics from Vienna were moved to the O’Hare location like coffee urns, chandeliers and a grandfather clock. The Pillsbury Corporation acquired the seven remaining Henrici’s locations in 1979. The Henrici’s at the O’Hare Inn, which by then was a Ramada Inn, closed in the mid-1980s. Cream butter and sugar. Add eggs one at a time, beating well after each addition. Add lemon rind and juice and beat well. Add sifted dry ingredients alternately with milk. Grease and flour a tube pan. Sprinkle bottom of pan with chopped walnuts. Pour in batter. Bake at 315 degrees for 55-65 minutes or until toothpick comes out clean. Cool 25 minutes on wire rack, then invert onto plate and sprinkle with powdered sugar. In the late ‘50s or early ‘60s there was an explosion at Bally Manufacturing near California and Melrose. Do you have more details? There was in fact a mysterious explosion at the Bally Manufacturing factory in the Avondale neighborhood in 1969. The Chicago Tribune reported that people within a 2-mile radius of the plant heard and felt the blast shortly at 12:48 a.m. and called the police. No one was hurt, but significant damage was done to the factory, which famously made pinball machines. The police found that the explosion was caused by a dynamite bomb set just outside the factory. Neither a motive nor culprit was ever reported in the papers, but it’s worth noting that organized crime has a history with pinball and also slot machines which Bally also made. Bally was just one of a number of companies in Chicago that made pinball machines including Gottlieb and Williams Electronics, which later merged with Bally and still has offices in the neighborhood. The only Chicago-area company still making pinball machines is Stern Pinball in Elk Grove Village, which Chicago Tonight visited in 2016. Bally originated as the Lion Manufacturing Corp in Chicago in 1931. Lion created a popular pinball machine called “Ballyhoo,” as well as slot machines, sewing machines and ballpoint pens. During World War II, it aided the war effort by making detonator fuses and gun sights. After the war, Lion expanded its gaming business, making pool tables, amusement park rides, and other things like televisions and coffee dispensers. In 1968, Lion changed its name to the Bally Manufacturing Corporation—a reference to that first pinball machine. The factory was located across the river from Riverview Park, and Bally named some of its games after park attractions like Aladdin’s Castle. The company continued to grow, buying health clubs—remember Bally Total Fitness?—the Six Flags amusement park chain, and casinos in the 1980s. Bally was was acquired by Hilton Hotels in 1996 and the health club was spun off as an independent company. It went out of business in 2016. The old factory was vacated by Bally in 1983 and later demolished; it’s now the site of a townhome development. Note: This story first aired on “Chicago Tonight” on April 25, 2018.